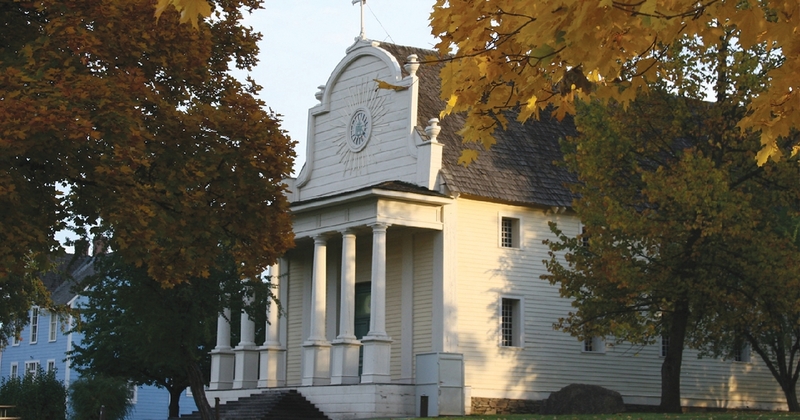 The Sacred Heart Mission at Cataldo is the oldest standing building in Idaho. It may be stretching the definition of “museum,” but the Mission is certainly historic, and adjacent to it is a 9,000-square-foot visitor center where early history is portrayed in a true museum setting. Father DeSmet brought Catholicism to the Coeur d’Alene Tribe in 1842. The first mission was near present day St. Maries but was subject to flooding, and a new site was chosen near present day Cataldo. They used no nails in its construction, yet the building still remains in good condition. Paint was limited, and workers used huckleberry juice to color portions of the ceiling, giving a feel of blue sky. That color remains, some 160 years later. The Roman Catholic Diocese owned much of the land since the mid-1800s. It was placed on the National Register of Historic Places in 1962 and in 1975 was designated a State Heritage Park and named Old Mission State Park. The Roman Catholic Diocese of Boise gave the land and buildings to the Coeur d’Alene Tribe in 2002. The visitor center opened in 2009, followed in 2011 with the opening of the exhibit entitled Sacred Encounters: Father DeSmet and the Indians of the Rocky Mountain West. This exhibit toured across the country. The opening exhibition, in Bozeman, Mont., drew 112,000 visitors. It progressed to many cities and three countries over the next three years but never came to Idaho due to lack of a secure facility with climate control to protect the exhibit items. A local non-profit organization formed in 1998 to enhance the mission and provide a facility as a permanent home for the exhibit. Visitors walk from area to area, covering nine rooms. Some rooms contain static displays, while others are videos with music and voice. The intent is to show early encounters between native people of the region and Christian missionaries. The first area contains an audiovisual with tribal elders talking of their spiritual world before missionaries arrived. The second area has a huge photo of Father DeSmet’s home in Belgium plus a chalice dating to the mid 1700s and a baroque alter from that era. Numerous church items are on display, including a letter from Father DeSmet and a Bible from that era. Items from his home in Belgium and scenes from his life with Indian people add insight to his life. Other exhibits reveal the early history of the Salish people and the transition as horses first arrived and trappers came. Such tribal objects as a buckskin dress, a large root bag, moccasins, a fringed medicine case, and others are on exhibit. Another exhibit area holds a primitive church, a reconstruction of the first mission in 1842, made of poles, with sounds of singing from the altar. Musical instruments are on display, including a clarinet that likely belonged to Father DeSmet. Various other artifacts are exhibited throughout the museum. A quote by Peter Campbell, of Spokane/Coeur d’Alene, sums up the museum. “It’s a beautiful testament to American Indians and the Coeur d’Alene Tribe specifically.